David Wojtowycz lives in London with his cat Millie and illustrates greeting cards. 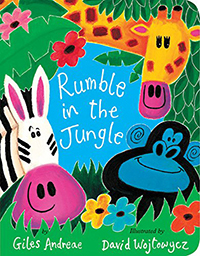 Join this rhyming safari and meet everyone from the elphing elephant to the gangly giraffe, and maybe even the terrible tiger! Rounded corners and sturdy board pages add to this great title!